Deck the halls—and illuminate your Christmas greetings—with this dazzling holiday display. 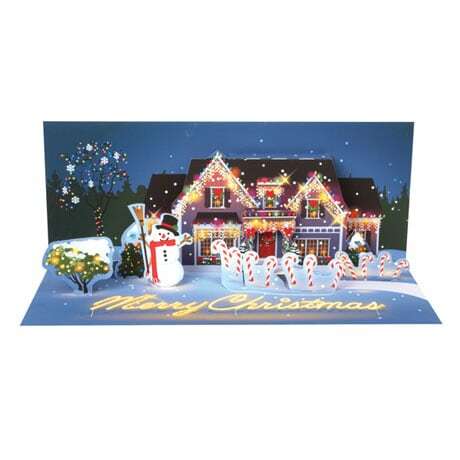 The light-up 9¼"x3¾" panoramic card opens to reveal a home festooned with Christmas lights and greenery, all of which sparkle to life at the touch of a button. With space on the back for your own good tidings, this unique card will earn a place of honor in the home of everyone who receives it. Additional postage required. Buy 2 or more and save 20%!